I have recently been bitten by the miniatures bug. Symptoms include snapping up dollhouses on eBay whenever possible and looking at everything with an eye for "Can that be a tabletop/chair/bookcase/whatever for my dolls if I turn it upside down/sideways?". When you don't throw away bottlecaps, lids, or that weird tray meant to heat up a microwave pizza, you know you have the fever. I really got bit when I discovered that dollhouses are not all old fashioned and hokey or Gothic and friviously Victorian. 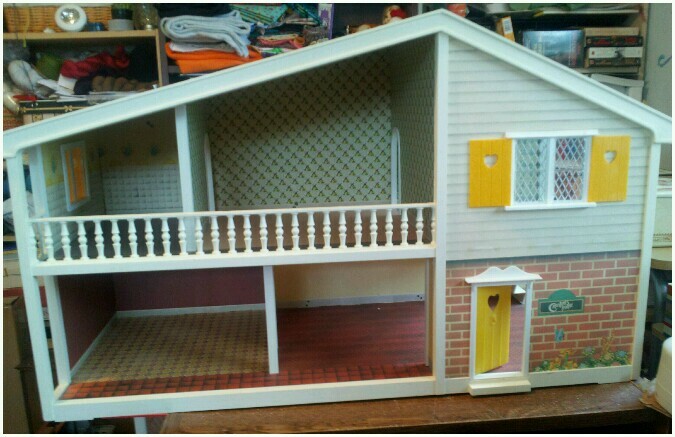 Imagine my shock when I found out I could have had a Tomy Smaller Homes dollhouse as a tot, or even a Caroline's House in the 1980's, both with a fantastic modern look and feel! Now I have a Tomy Smaller Home and a Caroline's House. I have started gathering all sorts of nifty furnishings for both. I just need to find room to properly work on them (the Tomy house needs a lot of restoration, but I'm foolhardily excited by the challenge), and I need display room to play with them. Yes, I fully admit I want to play with my dollhouses. Why not? At least I can afford to make renovations in 1:12 scale.